Fine's a good word for this novel about a lonely woman. I sat back, feeling a bit queasy. Illiterate communication was quicker, that was true, but not by much. I'd saved myself the trouble of typing four whole characters. Still, it was part of my new credo, trying new things. I'd tried it, and I very definitely did not like it. LOL could go and take a running jump. I wasn't made for illiteracy; it simply didn't come naturally. Although it's good to try new things and to keep an open mind, it's also extremely important to stay true to who you really are. I read that in a magazine at the hairdressers. I went into this expecting the next Where'd You Go, Bernadette -- it's "quirky," "wacky" "hilarious" "warm and funny" "warm and uplifting", Honeyman is the next Fredrik Backman, etc. I did not find it. I'm not sure I laughed at anything -- I might have smiled at something sweet, but nothing more amusing than the above quotation. Do I think I'd have liked it more if it had been funny? Probably not. I probably wouldn't have read it, however, if I hadn't thought it was. This is not a bad thing, not every book has to be funny. I'm just saying I went in expecting a chuckle, a wry smile, something amusing and didn't get that. Instead I got a sad, but ultimately nice story about a poor, lonely, shy and socially awkward woman dealing with her personal (and repressed) demons the best she could -- which really wasn't all that well. I didn't find her amusing, I pitied her. I felt bad for her. I got annoyed when people made fun of her. And I wanted her to figure her life out so she could be an amusing character. Eleanor is 30, has been doing the same job as a finance clerk for a graphic design firm since she got out of university -- she goes to work, talks to her "mummy" Wednesday evenings, gets a frozen pizza, some wine on Fridays and knocks off two bottles of vodka each weekend (spread throughout Saturday and Sunday so that she's "neither drunk nor sober"), then repeats the cycle. it's not much but it's her life and she's fine with that. Her life goes in that way with very little variance for about a decade, until she's befriended by an IT worker, Raymond, in her company. Through him, and other accidents, she meets people. She also does things like get a smartphone, go online for things non-work related, and sorta cyber-stalks a musician. Shortly before meeting Raymond, she'd attended a concert of some local bands (won tickets in a drawing at work) and became infatuated-at-first-sight with a singer -- in the way that a thirteen year-old girl does when encountering NKOTB/'NSync/One Direction/insert your time-appropriate band. Eleanor's childhood was such that she delayed this stage until now. 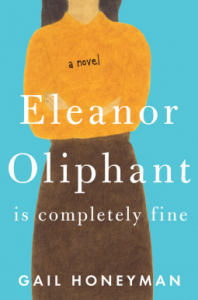 On the one hand, I thought this was a great instigation for Eleanor's life to change, but man, I kept cringing every time the story came back to it. Minor, very minor, spoilers: Her social life is the best it's ever been, things are picking up at work, but there's this delayed adolescence thing lurking -- all the while she's having problems with mummy. Things go horribly, horribly, horribly awry -- but then there's a chance for her to put her life together again, and maybe discover what went wrong in her very bad childhood, so that she can have a better adulthood. The characters are well-drawn, well-executed, and pretty realistic. The situations -- all of them -- ring true. Honeyman can write really well. I thought the story moved well, and the reveals, the twists, the heart-warming moments (and the tragic ones) were all spot-on. I just didn't enjoy the book that much, it wasn't bad, it wasn't great. It, like the title character, was completely fine. Your mileage may vary -- and judging by reviews (professional and otherwise), sales, and attention this book is getting, there's a great chance you'll think I'm out to lunch on this. I may be.